The idea of sudden body color changes might seem alarming and strange to most humans, but to bearded dragons (genus Pogona), they're all in a day's work. 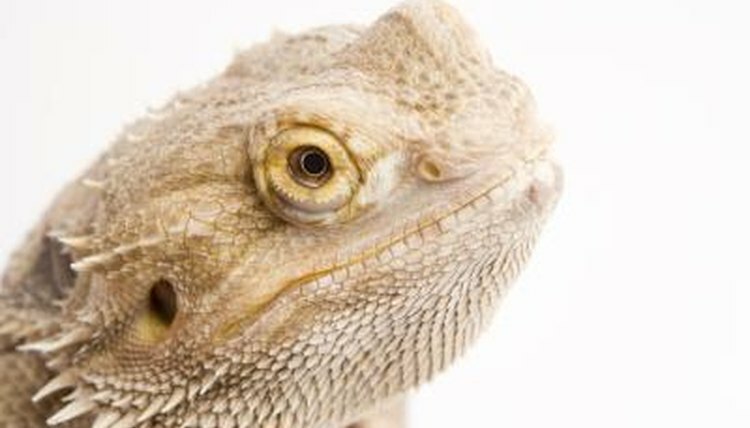 A variety of different components can lead to the temporary darkening of bearded dragons' skin, from temperature to current mood. If you notice that your bearded dragon regularly gets darker early on in the day, it could mean that he's trying to soak up all of the heat the sun is emitting. Darkening assists bearded dragons in controlling the temperatures of their bodies. If this is indeed what's going on, you'll notice that your lizard also always gradually gets paler and paler the later in the day it gets. Note, too, that bearded dragons often darken dramatically in times of cold, no matter how vivid and light their coloring typically is. Bearded dragons don't have actual hairy beards, but rather pouches on their throats that are capable of getting darker, hence the "beard" effect. When bearded dragons feel intimidated, frustrated, territorial or defensive, they often enlarge the size of these pouches. In these types of situations, the pouches also swiftly take on markedly darker looks -- think black or deep purple. It also is common for bearded dragons to do this when they have the drive to mate. If you notice that your bearded dragon has a darker throat, then it could indicate any of these things -- all of which are 100 percent normal and not "bad." Male specimens' beards are generally darker than those of the girls. The darkening of bearded dragons, while often totally A-OK, can sometimes be an indication of unpleasant things too, so take note. Bearded dragons' throats often become darker when they're suffering in extreme discomfort, or coping with a major sickness. Bring your beardie to a herpetological vet immediately if you think that a health issue might be a factor in his coloration issues. If you have two bearded dragons that are of totally different coloring, that's nothing out of the ordinary. Bearded dragons are extremely diverse in that aspect. Some of them are naturally striking orange or crimson. Others are a more muted gray, reddish-brown, brown or tan. A lot of bearded dragon coloring is actually an adaptation of their native living environments. If a bearded dragon is a certain color, it often means that the stones and dirt of his home habitat were the same many, many years ago.